Corned beef, people: it is two different things, depending. To the British, it comes in cans and is a kind of disintegratory beefy spam, also occasionally sliced and battered and fried into fritters. None of this is any good at all, but this was my only experience of corned beef prior to California. Anyway: I mention this because I cooked corned beef yesterday for Thursday dinner (which was also our fourth anniversary, as it happens, which it was nice to have a gang of friends around to share). And contrary to my usual habit, I actually wrote down how I cooked it, which is kind of a prerequisite to posting a recipe, because I'll never remember else. Typically, I then forgot to take any photos, which is the other prerequisite for anything that claims to be any kind of a food blog, hey-ho. Peel a couple of onions, divide them into six wedges each, and lay those on the bottom of a slow cooker (or a casserole dish/Dutch oven if you don't have a slow cooker, but this is what I did, because I do). Rinse the corned beef, and set it atop the onions. Whisk half a cup of ketchup (or a little more - I just used what was left in the bottle, which would be more than half a cup but less than a whole one, by US measurements) with a bottle of dark beer (I used Maltopia Wee Heavy Scotch, because that's what I had in the spare beer bacon fridge) and pour over the meat. Add lots of pepper. You won't need salt. Cook on low for ten hours (or in the bottom of a low oven for probably four or five, but I haven't tested that). Slice, and pour over a little of the cooking-liquid. Serve with mashed potatoes and braised cabbage; completely forget to offer house-made kimchi alongside, although it's really not bad at all for a first attempt. Sigh. *The question is rhetorical, except not really. So various things have happened, personal and travel-related and such, and relatedly or otherwise, I have been neglecting this journal shamefully. But now we are home again, and I am fully resolved to mend my ways: in pursuit of which mending, one thing I want to do is talk more about food. Especially Thursday food. As you know, Thursday is when friends come around to dine: sometimes half a dozen of 'em, sometimes twice that. It's never a dinner party as such, it's just a chance for them to hang out and for me to show off, or to experiment, or just to stretch myself. It is, in fact, all about me. Unsurprisingly. Anyway: we've been away, and now we're back, and this is the first Thursday since the interregnum. And as we just spent two weeks in England and I somehow managed not to eat a single curry, guess what I'm cooking tonight? Specifically, I am cooking the dish I most despise, the dish most laughed at among the soi-disant cognoscenti of the English curry cuisine: I am making chicken korma. And I mean for it to be awesome. Thing is, chicken korma as served in every British takeaway is essentially curry for people who hate curry: cooked with boneless chicken breast so mildly spiced it might as well have none at all, thick with cream, padded with banana and pineapple and I know not what more. It's what they sell to the old folk who've never crossed the threshold of a curry house before, and to kids who've never so much as put pepper on their eggs. But it doesn't need to be like that. My chicken korma is going to be redolent with onion cooked sweet and slow, heavy on the ginger and the garlic, flavoured with fennel and coriander. There will be serrano chillies, left whole for those who don't like 'em to pass 'em on to me. The chicken will be dark meat, thighs, and cooked on the bone for better savour. That'll cook with its yogurt marinade and not a hint of dairy more. No cream, no fruit. Ground cashews to thicken the sauce. And there'll be a vegetable curry on the side, and a channa dal, and lemon-rice-without-the-lemon, as is traditional around here. I'll let you know if anyone storms out. ...except that these days, actually, one does. It was one of those stray thoughts I had, as I stood for ever over the stove, stirring and stirring as the onions slowly darkened in the pan - "Is there no way to do this in the slow cooker, bethinks I...?" Yes, of course there is. Slice onions, put in slow cooker. Add a glug of oil and a shake of salt, toss 'em about a bit, start the cooker on low. Stir every now and then, as you pass by. Ten hours later? Caramelised onions, yup. Which makes onion-soup-for-the-masses a far simpler proposition. Do that, with five or six pounds of sweet onions; then proceed through the portals of your favourite recipe. I default as by nature to "Mastering the Art of French Cooking", but actually this one's more by way of being Californian Onion Soup. I looked at the amount of delicious oniony liquid that still lingered with the onions, because slow cooker; and was opposed to stirring flour straight into that, because that way lies lumpiness, which is deprecated hereabouts. So I made a separate roux with half a stick of butter and three heaped tablespoons of flour, and stirred that in. And then I had a litre of something in the freezer that was labelled "Beef Soup Stock", in my own hand, and I have no idea. So I defrosted that and gazed at it in bafflement, and stirred it in anyway; and there was half a litre of something else called "Beef Onion Soup Stock", which ditto ditto. And then there was half a bottle of abandoned sweet red wine in the fridge, which nobody was going to drink, but hadn't spoiled, so. In it went. And now the result of all that is back in the slow cooker and simmering slowly, and I think it'll be grand. For some inexplicable reason, our local acquaintance (m'wife included) continue to find my buns hilarious. As everyone knows, explaining the joke kills the humour. Mix the dry ingredients together in the bowl of a stand mixer, add the wet ingredients and let the dough hook at ’em. Keep it to a low speed - 2 is just fine on my KitchenAid - and let it work everything into a dough, then give it another six minutes. Take the bowl out of the machine, lift the dough ball out of the bowl and dribble in a little olive oil; roll the dough in the oil until it’s coated, then let it sit covered in the bowl until well risen, an hour or two depending on environmental factors and the freshness of your yeast. Dump the risen dough onto a counter or butcher’s block, divide in half with a dough scraper and then in half again. Roll each quarter into a tube, and divide into three or four pieces, depending whether you want big buns or dinner rolls. Work each piece into a sphere (ish), and set on a floured reliable baking tray (I use a Silpat sheet on a regular tray; baking parchment is also excellent; natively nonstickerised will do too, or simply well-seasoned will be fine - I could use my trays without the Silpat, but hey, I’ve got it, so why not?). When you have set out between a dozen and sixteen buns or rolls, you will have no dough left and are done. Cover ’em with plastic wrap and let them rise 45 minutes to an hour - you want a little resistant spring in ’em, so that they’ll rise more in the oven. If they’re over-risen, the most they will do is collapse. With a pastry-brush, coat the exposed surface of each bun with beaten eggwash, and scatter sesame seeds generously over all. Bake in a preheated oven at 400F, 200C, gas mark 6 for 15 minutes. Have a look; they might want a couple of minutes more, depending on your oven. When they’re golden brown and hollow-sounding, take ’em out and slide ’em onto a rack to cool. Fight your wife & guests off for at least fifteen minutes, to let the texture set; it’s a dirty job, but someone has to do it. Squishy rolls are nobody’s friend. For lack of a jam-pan, enter my favourite stovetop utensil. A wok is splendidly the right shape for jam-making. Just don't try to pour out of it; I find that not to work so well. So that's another two pints of strawberry/balsamic/pepper jam potted up. And a fascinating scientific question raised: why does jam appear to get cooler as it boils towards the thickening/setting point? It's not what marmalade does, at all; but seriously. Both the last batch and this, I clocked at 214F when they were nowhere near setting, and then at 209 when they were nearly ready. At which point I abandoned the thermometer and went by eye. There's precious little pectin in this, which must make some kind of a difference: but it's thickening up, water is boiling off, why in the world is the temperature dropping? So we have all these strawberries. It can happen, hereabouts. Monday's strawberry-and-rhubarb jam is nice. I am pleased with it. But I had no more rhubarb, so yesterday I made strawberry balsamic jam with black pepper. This, O my people. This is the thing. Take a kilo of strawberries; hull, halve, quarter if they're huge. 350g of sugar. Stir together, and leave the fruit to macerate for a couple of hours. Stir it every now and then, if you like that sort of thing. Dump it all into a broad pan, bring to a boil, squeeze in half a lemon and seethe it, stirring every now and then, until it's ready to set. You can do saucer-tests to confirm this, or use a spoon, or just go by eye and ear: when it's sizzling on the bottom of the pan when you draw a spatula through it and it doesn't immediately flood back, when you can actually see the bottom for a moment there, it's pretty much ready. It'll be a soft set, because there's not much pectin in it, but it shouldn't be runny even so. I disavow runny jams. When you're tolerably sure that it's ready, turn the heat off, and stir in two tablespoons of balsamic vinegar and half a teaspoon of freshly ground black pepper. Jar it up (you'll get about three half-pint jars out of this), seal it according to your preference (I am all about warm jars, screw the top on and don't worry about it; other people are all about ten minutes in the waterbath or you'll all die; my entire continent has not died yet, but who knows? Maybe tomorrow we will) and it would technically keep for a year or more but I bet you eat it before then. Tonight's dinner will be a shrimp salad with mushrooms and bacon and broccoli and French beans and spinach leaves and asparagus and avocado and baby tomatoes, all tossed in a lemon and garlic dressing. I invented this last weekend, and it was delicious, and on the way to the store just now I was just thinking "if I ever do write that cookbook, I'm totally putting this in; I wonder what I should call - oh, wait..." as I remembered that there was a word already, and it was salmagundi and I hadn't really invented it at all. Still. There is nothing new under heaven, Horatio, tho' an endless number of things; and this one has no anchovies, because my heretic wife cannot abide the anchovy, so it's barely a proper salmagundi anyway; so I shall call it a shrimpagundi and put it in my putative cookbook anyway. Which will almost certainly remain putative to the end of days anyway, so. What do Lambda Award winners cook? Thanks to Jeannie (thanks, Jeannie! ), we had lamb (duh! )* for non-yogic dinner last night. Slow-baked with Indian spices, because hullo, mere awards aren't going to shift my palate westward. Heat mustard oil in a wide pan, and add a teaspoonful of black mustard seeds; clap a lid on when they start to pop. When they've stopped popping, add a finely sliced onion and sizzle until softened and translucent but not coloured. Then add a finely shredded cabbage (preferably savoy), an inch of finely chopped fresh ginger, a few whole fresh bird's-eye chillies (if liked: I used red ones, figuring people would spot them and not eat them if not liked, but alas, m'wife took one for a carrot...), a teaspoonful of chilli powder, a teaspoon of turmeric, salt to taste and a generous splash of water. Mix it all up, clap the lid back on and cook until the cabbage is tender-crisp. Heat a splash more oil in a small pan and add a couple of teaspoonsful of panch phoran (a mix of whole seeds, generally equal parts nigella, black mustard, fenugreek, fennel and cumin; you can buy the mixture at Indian stores, but it's just as easy to mix 'em yourself). When the seeds crackle, dump the whole contents onto the cabbage and stir it in and serve it forth. *Okay, did anyone see what I did there? Anyone? Bueller? Anyone? In Mac's eyes, it seems, cuddles are no substitute for porks. No substitute at all. Since you need catching up, I should tell you that yesterday, bearing in mind the new-crowned tooth and all, I skipped lunch altogether and made a supper of things that needed little chewing: a stir-fried dish of chicken and green garlic, with rice-and-mushrooms and long beans in ginger (and even the beans cut short, so as not to call for undesirable biting). And a searing chilli oil that I am really pleased with, fresh ripe red Thai birds-eye chillies sizzled with chunks of garlic and ginger, with a sploosh of soy to finish off. I am unsure that even the copious oil will preserve it long, but I can always drain the oil off and keep that for ever, while I slurrup down the crunchy bits instanter. But that was yesterday; today I was bolder. Lunch was leftover rice topped off with duck eggs and more of that ecstatic oil, but tonight we had pork tenderloin roasted on a bed of beets glazed with balsamic and honey, with roast cauliflower and brussels sprouts beside. And Mac was very, very interested in that pork, oh yes. And just when he would have been possessing himself thereof, I risked my arms to cuddle him in lieu. Because I'm just that noble and self-sacrificial. I have boiled, cooled and dried rice. I have peeled shrimp. I have destringed (unstrung?) sugar snap peas. I have chopped ham and mushrooms and celery and asparagus and fennel and chillies. I have crushed garlic with a little sel de gris. Nothing now remains, but to sizzle and spice everything up, and then to eat it. I think we'll call it shrimp and asparagus with confit of fennel, and ham & mushroom rice with peas. I 'spect there will be soy and sesame oil in the rice, and maybe little more than fennel seed in with the shrimp. It's all up for grabs, though, till the oil hits the wok. Anything might happen. Which side should the ginger go...? I had actually been considering a rare political post, because if there is one thing that baffles me about the whole Geoffrey Dickens paedophiles-in-high-places missing-dossier saga, it is why on earth the man would have given such a document to Leon Brittan in the first place. Any such dossier drawn up in the '90s would have had to address the rumours about Brittan himself, which were current to my certain knowledge ten years earlier ("Leon Brittan fucks chicken" was a common graffito: unsupported by evidence but widely believed in my circles, and much discussed). If it didn't, then the dossier itself was an act of dishonesty and bluster; if it did - well. "Conflict of interest" is hardly strong enough, and the dossier's disappearance is hardly surprising. Haggis report: the full version. With pix. Tho' not, in the end, of the haggis. So I made a haggis, and I am pleased tho' not satisfied; and everyone ate some of it, and some people ate most of it, and there wasn't much at all left for my lunch today. And I'm mostly posting this for the record, because it may be some while before I do this again and I'd like to remember what I did; tho' I have also been asked for the recipe, which this is barely really a recipe so much as a process, but anyway. This is what I did. Then simmer the lungs, liver and heart in water to cover for a couple of hours. Save the liquor, and cool the meat. 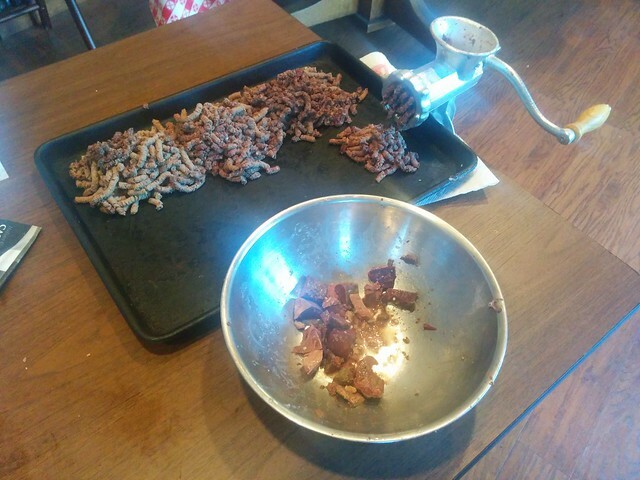 Follow the meat through the mincer with three onions. 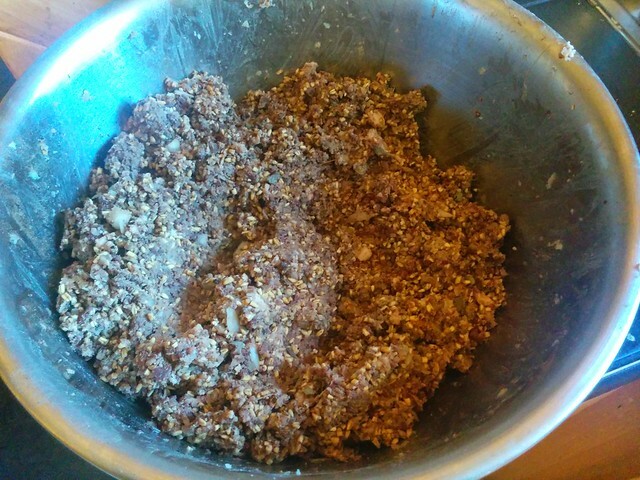 Mix all those minced things thoroughly together, and add half a pound of suet. 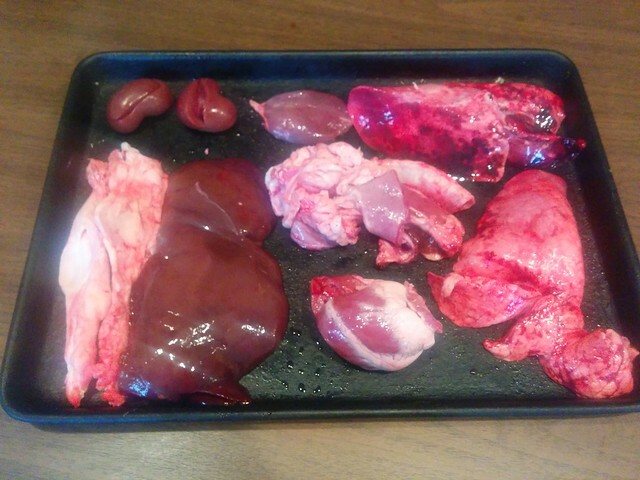 I used mutton-suet, to wit the fat that was around the kidneys of the sheeps, not rendered in any way but simply chopped very finely with a knife; but it took two sheeps'-worth to come close to half a pound. Weirdly, this was my favourite part of the whole process. Is suet-maker a profession? Toast a pound of pinhead oatmeal (steel-cut oats, for US consumers) on a baking tray in the oven, till it's golden and nutty, ten minutes or so; turn it over a few times as it toasts. Cool that down, and mix it in. Chop quite a lot of sage leaves finely, and grind a tablespoon of allspice berries. Mix those in, along with more than a tablespoon of salt (I used a tablespoon and it wasn't enough) and ditto ditto freshly ground black pepper (ditto ditto). Then set in a pan of water, bring to the boil and cook for three hours. At this point I would show you a photograph of the finished article, but I forgot to take one. 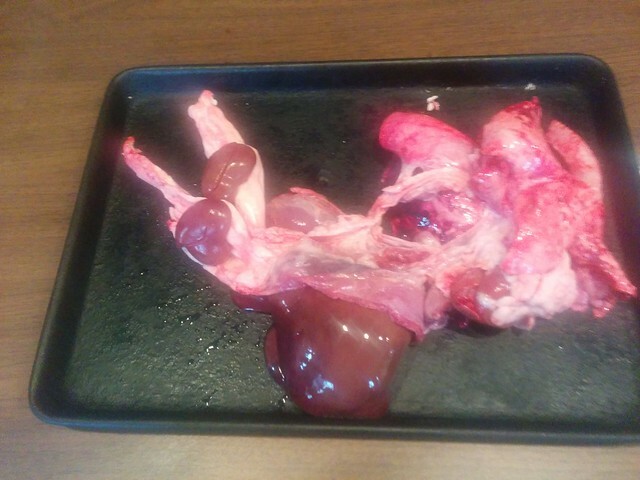 I believe others have posted pix to Facebook, but it just looks like a pudding-shaped skinless haggis. It is the 25th of January; it is Burns Night. It is also the day we celebrate Dave's birthday. Poor Dave, being Welsch, is not Scots: and nevertheless. Haggis it is, then. However. Being this far away, and in a land where haggis is illegal: I have butchered my pluck and boiled my pluck and ground my pluck with onions. I have mixed it with toasted oatmeal, with herbs from the garden and allspice from the rack, with kosher salt and lashings and lashings of fresh-ground black pepper; and I am going to have to cheat the final stage, because I have no sheep's stomach and must boil it in a pudding-basin instead, but y'know what? At the moment, raw in a bowl - it don't half smell like haggis. So far, I am cautiously optimistic. Rather to my surprise, it turns out that my favourite (so far) of the Meyer lemon marmalades is the kind I make the same way I make Oxford marmalade with Sevilles: essentially weigh the lemons (for later), cover with water and boil 'em for an hour, leave 'em in the water overnight; next day scoop out all their insides and parcel that up in cheesecloth or muslin, chop the peels and add them back to the liquid, add sugar equal to the lemons' original weight, add the muslin bag (for flavour and pectin), and boil to a light set. Fish out the bag, squeeze it in a colander over a bowl, pour the squeezings back into the pot, let everything sit for ten minutes and then ladle it into warm jars and seal. And this morning Katherine brought her dehydrator round, so I'm going to try slicing and drying a few, see what I can do with those. ...make Meyer lemon marmalade. Obviously. Thanks to the generosity of a neighbour with an overproductive tree, I have a bagful of fresh-picked lemons. And thanks to a dreadful miscalculation last Seville season, and/or a ridiculously generous nature, I ran out of marmalade a month ago and have been spreading my toast with jam. Jam! So: I made a sample batch of Meyer lemon marmalade which is perfectly acceptable, but we need to know more, for science: is this the best possible marmalade that can be achieved? (My Oxford marmalade, I should point out, is the exact perfect expression of Seville oranges, so these poor Meyers have a lot to live up to.) So tonight and tomorrow I'll make a new batch with a different technique, and we will compare and contrast. Meanwhile, it's coming on gin o'clock. And I have all these lemons. Oy. Honey, can you show me more? I read today in my internets that the US govt is allowing honey producers to mix corn syrup with their honey and still sell it as 100% pure honey. Sometimes the stupid it burns us it does. Precious. However, we all have our own stupids, and I'm sure that mine are burnful to other people. Sometimes they are even burnful to myself. As for example my dithery nature. Ever since two things crept into my consciousness - serious food blogging, and Kickstarter - I have had this little private yearn to mix the two together, and Kickstart a food-blog project. It wouldn't be too expensive - set-up costs for a tolerably complex website, some professional design work, a DSLR camera and a little training in food photography - and, y'know. Food, Chaz and the internet - we go together well. And I could call it "All The Better", for reasons of a wolfish appetite and aspirations to improve; and stretch goals could include themed little books, "All The Better: Bread" and so forth, and oh, it is such fun to think about. So of course that's what I've been doing, holding it in my head like a treasure, while the world has become oversupplied with both food blogs and Kickstarter projects. And sometimes I think "Oh, c'mon, Chaz, you haven't even finished a novel since you came to America; why in the world do you imagine you could even consider taking on some new timesuck that's only going to fail anyway?" and sometimes I think "Yeah, but I haven't even finished a novel since I came to America, so maybe I'm not actually a novelist any more, and it might actually be time to think about doing something different," and yadda yadda, like that. Honestly, I think its time is past, if ever it existed. Maybe I'll write a novel about a food blogger, and settle for that. Meanwhile, my friends to continue to let me cook for them. Back at the weekend Dave took me to Costco, and one of the things I came home with was a 25lb sack of salt, because I've always wanted to bake things in salt and never have. So yesterday was a halfway-house kind of dinner, where I wrapped a chicken in a salt pastry crust not meant to be eaten, kinda like a mediaeval coffin (and of course Katherine and Mac and I all tasted it, and yup: not meant to be eaten), and it came out moist and delicious and more thoroughly imbued with salt (in a good way) than I had quite expected. Which leaves me wondering how salty the flesh would be if it's packed in pure salt rather than a flour/salt crust. There is, of course, only one way to find out. But I may dither for a while. I was told I could cook what I liked for my birthday. So I was thinking duck, and I was thinking vindaloo, and I was thinking that I'd wear my new T-shirt with the capsaicin molecule on it. Only then I was down at the farmers' market yesterday, and the nice eggs girl had rabbits. So I zoomed home to check, and zoomed back; and now I'm cooking rabbit. And I did dither over currying it, but actually I curry quite often, and I very rarely cook classic French any more; so I'm cooking Blanquette de Lapin au Confit de Poires et Gingembre, out of Paula Wolfert. And I'm wearing my Duck Duck Confit T-shirt, which is at least genre-appropriate if not quite ingredient-precise. Today's meaningless chanting is brought to you by the letter C (to the tune of Don McLean's Vincent, an earworm of such longstanding it has rent protection and all the privileges of a citizen). - and the cynosure of all eyes, the piece of probable resistance, a whole roasted pig's head. I know I said I'd do soused pig's face, but I can't find the book and I'm a tad stressed and so forth (see above, under razor blade, and ask yourself when I last slept past five am) so I'm going for the easy option**. The pig's head is currently relaxing in a nice warm bath, his snout poking out like a periscope, wreathed in steam. White Cat has already come to pay a social call, but I had to turn him away; Mr Head does not receive visitors in his bath. Also worth remembering: the black pudding/ground pork/apple/bread stuffing came out really well. And I kind of invented it, so I should probably write something down. Lots of fresh sage in that, and English sausage spices - mace, nutmeg, ginger. Lots of pepper. And concomittantly, you can't make black pudding stuffing without black pudding, so I should probably ensure a steady presence of that. Happily, it freezes perfectly well. And bolstering the turkey stock with the neck of this year's bird and a few more veggies? That really works, too. I could have supped just on the broth and been happy.